This week's Changemaker is Michael Sheldrick. 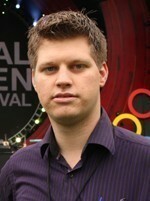 Michael is the Global Policy and Advocacy Manager at Global Poverty Project. Michael Sheldrick is the Global Policy and Advocacy Manager at Global Poverty Project, an education and advocacy organisation focused on ensuring both the public and private sectors in OECD nations take action to contribute to the end of extreme poverty. This week we profile Michael in Changemakers – a weekly column which examines inspiring people and their careers in the Not for Profit sector. The Global Poverty Project utilises the power of education, communications, advocacy, campaigning and the media to advance the movement to end extreme poverty. I am currently the global lead for the Global Poverty Project's The End of Polio campaign. We're working with our partners to mobilise the public and political support necessary to realise a polio-free world. I've just finished leading a big advocacy push in the run-up to the first ever Global Vaccine Summit, which was hosted by Bill Gates, the UN Secretary General and the Crown Prince of Abu Dhabi in late April. The Summit saw $4 billion pledged out of the $5.5 billion needed to see the world certified polio-free as early as 2018. Now we're working towards raising the remaining $1.5 billion and Australia is one of the countries we're hoping will make a new commitment! The Global Poverty Project is a great place to work. On the one hand, it's still small and nimble enough to allow us to avoid much of the bureaucratic red tape that might slow down campaigners based in larger organisations. If you have a good idea you really are encouraged to put it forward for consideration and to try new things. As a result, I've been able to assume a fair degree of responsibility that few 24-year-old graduates would find at other organisations. At the same time, Global Poverty Project's vast networks and partnerships with organisations like the Bill & Melinda Gates Foundation really do allow us to punch above our weight and to have the greatest impact on shaping policy outcomes favourable to the world's poor. Ultimately, I love the fact that I get to work in a job that is part of making a difference for some of the most remote, marginalised and vulnerable communities in the world. "Why is an anti-poverty organisation like Global Poverty Project campaigning for the end of an obscure disease like polio?" For us, we see the end of polio as a critical milestone towards achieving our vision of a world without extreme poverty within a generation. Polio is a disease that has paralysed millions and dragged many more into poverty. The fact that we now see so few polio cases is the result of a 25-year effort to reach children everywhere with the vaccine. Polio eradication demonstrates the life-saving impact of our aid dollars; it demonstrates what is possible. Thanks to the efforts of Rotarians as well as Australian aid dollars, we've reduced the number of polio cases by 99% in my lifetime alone — from 350,000 cases in 1988, to just 223 in 2012. This amazing story of human endeavour demonstrates clear progress in the broader struggle against extreme poverty. If we can eradicate polio once and for all we will write a story of success that will reinvigorate public faith in a whole string of life-saving interventions. What (or who) inspires me? During my time with the Global Poverty Project, I've had the opportunity to meet and be inspired by some of the most extraordinary individuals and activists who collectively form part of the largest non-violent army the world has ever seen – the 20 million health workers and volunteers who have been involved in the global effort to end polio. I've had the opportunity to participate in immunisation efforts in India and meet just a few of the health workers who have been at the very heart and soul of this effort. I've worked with a remarkable group of Pakistani student activists called the NUST Bioreach Society who are taking it upon themselves to ensure a polio-free Pakistan. I've also met countless activists and Rotarians in key donor countries like Australia whose unrelenting stream of letters, phone calls, petition signatures, flash mobs and emails have helped ensure polio eradication remains a priority for our nation's leaders. Together, all of these activists and volunteers are the real heroes of polio eradication and it has been a privilege to play just a small part in their efforts. Their heroism and courage constantly inspires me as an advocate and campaigner. "We can't blame the politicians because we have to give them permission to spend what is in the end our money." – U2 Frontman, Bono. I quote this a lot because I think it sums up perfectly the work we do at the Global Poverty Project. In a democracy, public opinion quite rightly holds a great deal of sway over policy makers. It is our job to demonstrate to our leaders that the public supports life-saving interventions for the world's poor. In other words, we aim to show enough support so as to give leaders a compelling mandate to fulfill their international obligations to the world's poor.